The Rock is in the heart of Bury town centre and is easily accessible by car from the M60 and M62. The town is located at the junction of the A56 and A58. The A56 runs north-south between Yorkshire & Cheshire and links the town to Junc.17 on the M60 via Manchester Road and Bury New Road. The A58 runs east-west and connects Bury to Junc.2 off the M66, which is less than 2 miles away. The Rock is an easily accessible shopping centre near Manchester, Bolton and Rochdale. If you are planning your journey type in BL9 0JY to your SatNav. We are also accessible by public transport, with Bury’s central bus terminal and Metrolink station only a short walk away. Here at The Rock we understand the needs of our disabled customers and we strive to make your shopping experience an enjoyable one. All our car park levels have lifts running to the ground floor and the entrances to our stores are all on one level. There are disabled parking bays on car park levels three, four and five. 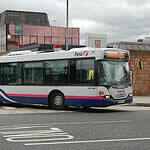 TFGM provides a number of bus services from Central and Greater Manchester to Bury. The Bury bus exchange is a 10 minute walk away from The Rock, passing through the town centre on the way. 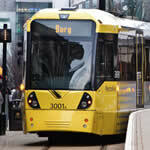 For timetable and ticketing information visit www.tfgm.com.